Grit and determination and hard-fought. These are terms sure to be slung about concerning last night's win over lowly Iowa. The Michigan men's basketball team has fallen so far, so quickly, that an overtime win against 9-18 (3-11 Big Ten) Iowa is seen as a confidence building, stepping stone toward mediocrity or better, The Future. I'm being unfair here. I don't like this basketball team and I want to see it deconstructed as quickly as possible. But then again, I don't like any of my sports teams currently, and seeing as Michigan basketball is the only one I'm currently talking about, it's probably getting the bluntest end of the blunt object I'm smashing my hopes with. Last night demonstrated a few things though. Primarily, that Michigan's struggles probably aren't solely because of three-point shooting, as had been speculated around the internets all year. Michigan shot a blazing 14-27 (51.9%) from outside in this game, albeit poorly from inside the arc. 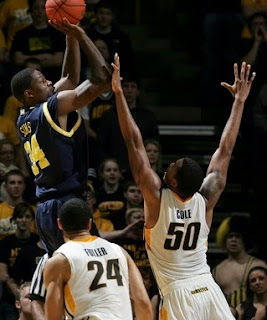 Regardless, though, Michigan finally shot well from outside but needed a last ditch three-pointer from DeShawn Sims to send the game into overtime for a victory over a bottom-dwelling Big Ten squad. The other thing we saw last night was that Michigan simply cannot guard the pick and roll, much of this falling on the shoulders of Darius Morris, who I have been quick to praise around these parts. Time and again, Morris wasn't strong enough or quick enough to fight over screens and stay with his man, nor was he quick enough or got enough help to go under the screens. Iowa got tons of good looks and ended up converting many of them, shooting a similarly great 10-22 (45.5%) from outside. Morris will get older and faster and wiser and will hopefully be able to work through this issue in the future, but what concerned me more was that Beilein once again failed to attempt anything aside from man-to-man. With how much the team was struggling with the pick and roll, a 1-3-1 or 2-3 would've kept Iowa on their toes and help nullify the massive advantage they had here, as well as help Zack Novak cover Aaron Fuller who he was clearly incapable of checking all night--Fuller shredded the team for 30 points on 11-13 shooting and 6 offensive rebounds. So what can we take away from this? Nothing, really. The season is still long-since over. The team's most effective player is still graduating, with the looming possibility that their best scorer will leave early for the NBA. And we saw the brief, fleeting moments of brilliance that we've come to expect the last two years from the likes of LLP, Zach Gibson, and Stu Douglass. Otherwise, we didn't learn anything from this game. I just want this team to be completely reassembled with new parts. Unfortuantely, we're going to have to suffer through at least two more years of extreme mediocrity before we see even a glint of hope.